One of my favorite things about spring is a new season of fresh fruits and vegetables. Well, that and the fact that there’s no longer snow up to my hips, but the Midwest is unpredictable and we can/have gotten snow on Easter. Fresh berries, beets, asparagus, and carrots are so welcome after a cold winter full of mostly root vegetables and citrus fruits. Don’t get me wrong, I love those things, but I start to get burnt out on them just around the time spring produce season starts. Admittedly, I made this recipe with frozen blueberries, since sometimes spring harvest is a little bit later where we live (thanks to the mountains of snow and the freezing temperatures well into March). Through my very scientific cooking and baking observations (meaning how pretty does it look and how good does it taste), I’ve determined that fresh and frozen blueberries can be used pretty much interchangeably. Unlike some fruits, frozen blueberries don’t turn into a mushy mess after you defrost them. If you follow me on Instagram, you probably notice that oatmeal makes a regular appearance in my diet. 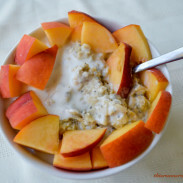 I eat oats for breakfast every single day—oatmeal with fruit and nuts on weekdays and oatmeal pancakes on the weekends. I’m pretty sure I could live off of oatmeal and sweet potatoes (and I’m pretty sure I did so for a while in grad school). I look forward to my post-run oatmeal and coffee and it never gets old. 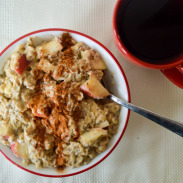 Oatmeal is my favorite for breakfast because it’s got all those good slow-digesting carbohydrates that runners need, it’s easy to make, and it can be made sweet or savory. Of course, I always go for the sweet option. It’s a serious foodie love affair, because the combinations are practically endless. 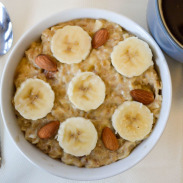 Banana and almond oatmeal. Apple and peanut butter. Chia seeds and berries. Dried fruit and nuts. The chia seed, apple, banana, almond, and brown sugar monster bowl of oats I devoured after a recent long run. 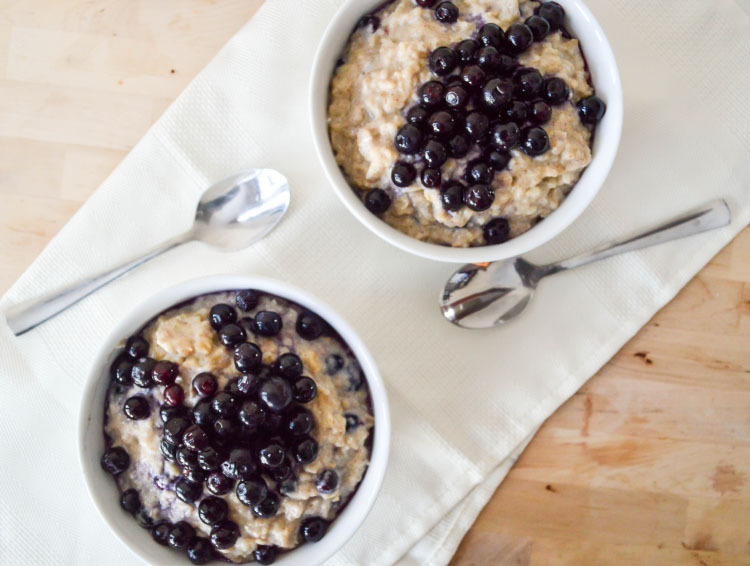 Blueberry pie oatmeal is the perfect spring breakfast to accompany the (finally here) spring weather. This oatmeal is sweet, slightly tart, satisfying, and simple. 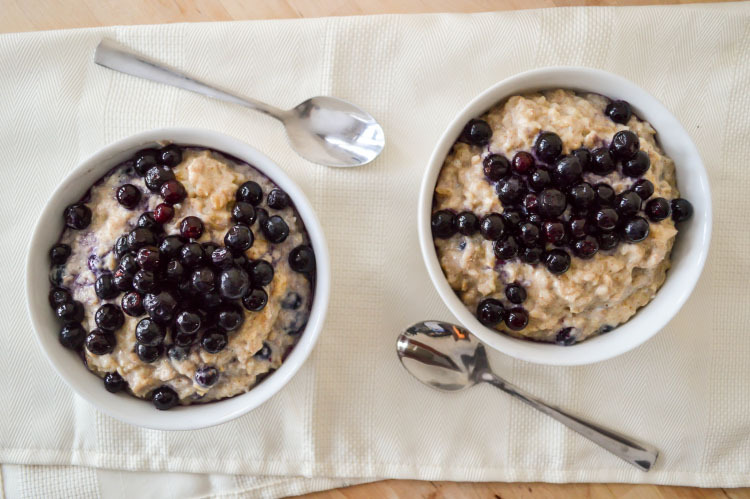 Cooking the blueberries in the oatmeal creates a juicy and creamy texture similar to that of a freshly baked blueberry pie! 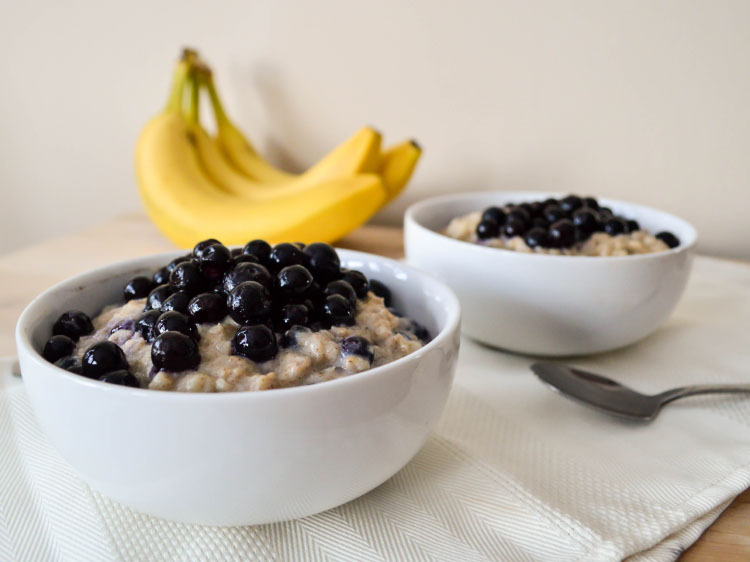 This blueberry pie oatmeal full of fiber, antioxidants, protein, and anti-inflammatories, which makes it especially nutritious for runners! 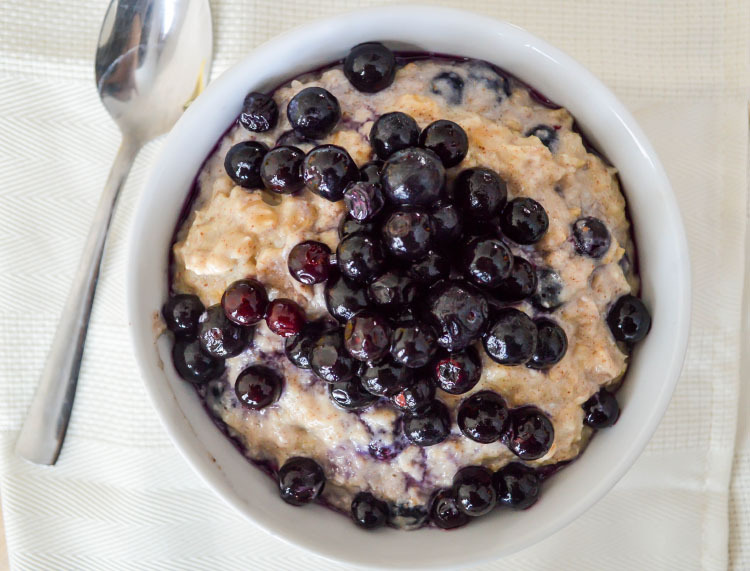 Blueberry pie oatmeal is seasoned with cinnamon and ginger, sweetened with natural applesauce, and topped with blueberries! To add a creamy texture and some extra protein, I did my usual trick of whipping an egg into the oatmeal during the last few minutes of cooking. This little addition makes such a difference in texture, volume, and staying power that once you try it, you won’t make oats again without an egg! In a large saucepan on the stove, bring the milk to a boil. As soon as it begins to boil, add the oats and reduce to a simmer. Simmer the oats for 5 minutes or until cooked. Stir in the applesauce and spices. Crack the eggs into the oats over medium-low heat and quickly whisk for about 1 minute until cooked. If you stop stirring before the egg is cooked, you'll have clumps of egg white in your oatmeal; continually stirring will distribute the egg evenly for the creamy, custardy texture. Stir in the blueberries and let cook on low for one minutes. Remove from heat and serve immediately. Add any desired toppings, such as brown sugar, nuts, bananas, or other fruit. This recipe can be easily halved or doubled, just adjust the ingredients proportionally. The cooking time will remain the same. If using frozen blueberries, rinse with warm water and let sit beforehand to defrost. I want to say congratulations to the winners of the Nuun Active Hydration Giveaway! The winners have been contacted through email regarding their prizes. Thank you so much to everyone who participated in the giveaway and shared it on social media! What’s your favorite oatmeal topping? Do you prefer sweet or savory breakfast? I love blueberries in oats and pancakes and such. Just let little burst or pop of flavor in your mouth is so homey and comforting! Blueberries are amazing in pancakes! Blueberry and chocolate chip pancakes are my all time favorite. This a great idea! I would eat this for breakfast, lunch, or dinner. Yum.